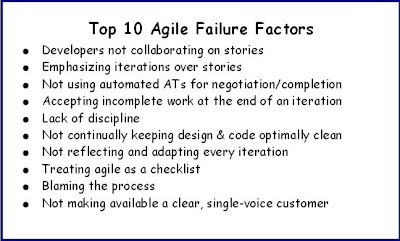 In working with teams attempting to be agile, we tend to see them make many of the same "mistakes" over and over. This list captures some of the most common pitfalls we've seen teams stepping into. Please take a moment to help refine this card by completing a short poll. It'll be open for a week, and we'll feed the results back into this list--both to help prioritize it and possibly swap out some factors for others. If you want to challenge any of the elements, you can of course add your thoughts in a comment. I just found this, thank to Brad Appleton's link. I'm glad to see you're moving forward with the idea - I think it's brilliant.